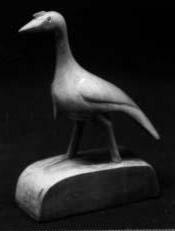 Remember when Thanksgiving was its own holiday and not just lumped into “the Holiday Season?” This post highlights objects with turkey motifs found in the NC Department of Cultural Resources’ collections and exhibits nostalgia for days of yore when Christmas decorations did not appear immediately after Halloween. 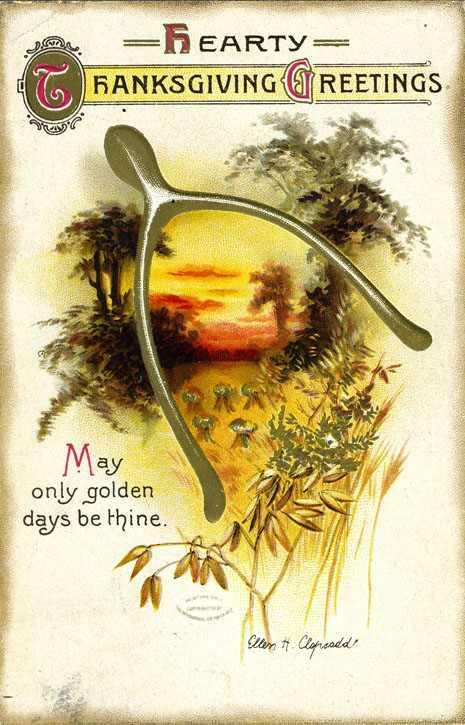 The card on the right dates 1948-1952 and shows a scene at odds with typical 21st-century experiences of the holiday. 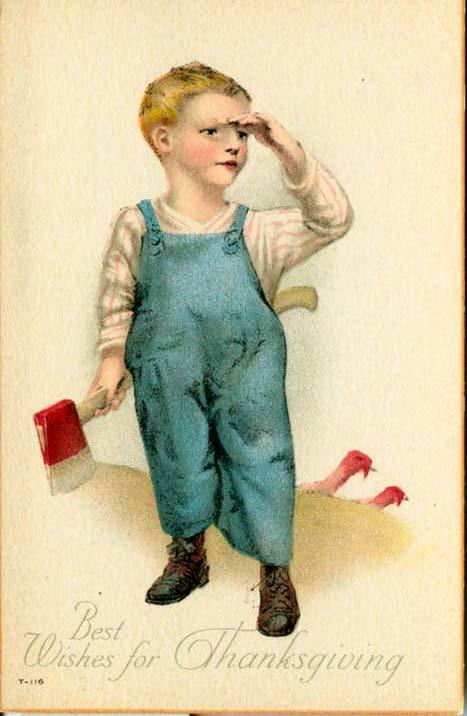 How many of today’s parents would send their pre-school boys outside with an axe to help prepare the focal point of the impending feast? 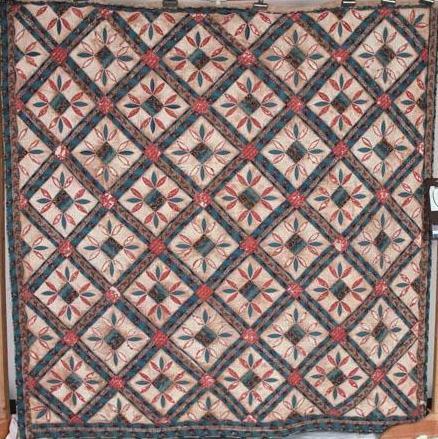 This “turkey tracks” pattern quilt dates to circa 1850 and incorporates pieces of calico dyed “Turkey red“–a newly possible and tremendously popular color during the mid-nineteenth century. Unlike the name of the quilt’s pattern, the term for the red dye referred to the Middle East, rather than the bird. 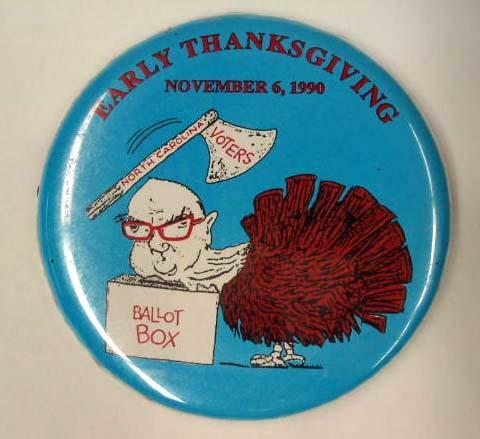 A wooden turkey figurine, carved of apple wood by John Hall of the Campbell Folk School in 1948, stands elegantly in contrast to the cartoon turkey with Jesse Helms’ head on this political button from 1990. 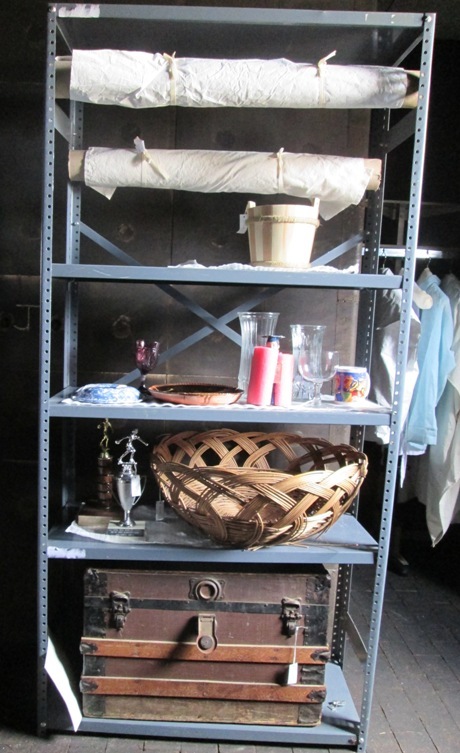 In preparation for our fire recovery workshops, we try to use a variety of storage materials in the mock museums we set up before a controlled burn. 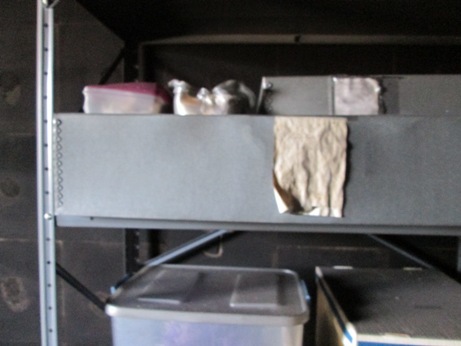 We stage plastic storage boxes, made from polypropylene (PP), and tyvek dust covers and artifact tags, made from polyethylene (PE), alongside storage enclosures made from archival board and muslin. The view on the left shows one shelving unit pre-fire and before we placed clear PE sheeting around the unit as a dust cover. 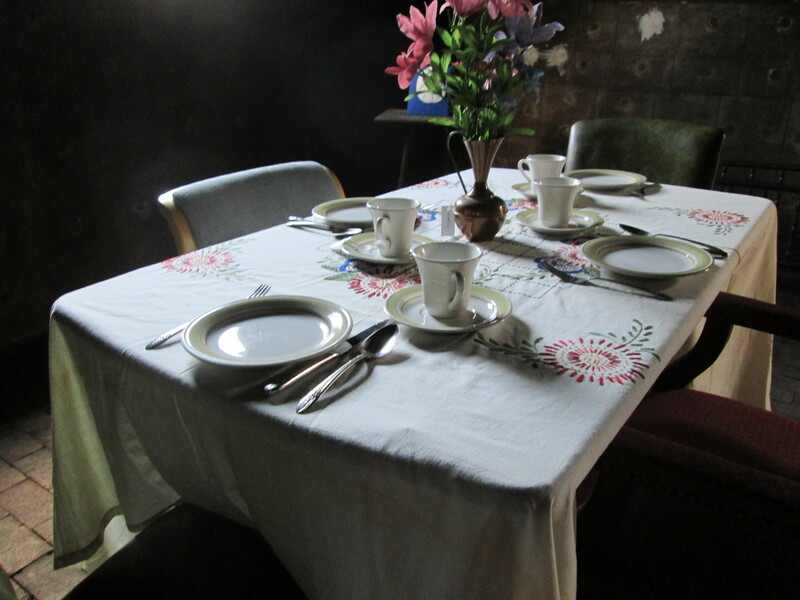 Note the tyvek dust cover on the uppermost rolled textile and tyvek tags hanging from objects. Although plastic enclosures can offer an additional measure of disaster preparedness for certain scenarios, such as water and pests, they do not protect artifacts as well as other materials in the case of fire. The fire, which burned at about 350 degrees for 2 hours, blew off the PE sheeting from its clips around the shelving unit and left the plastic cover a melted, sooty mess on the floor. Tyvek responds to extreme heat by shrinking up like a shrinky dink and eventually darkening and sticking to the adjacent artifact. 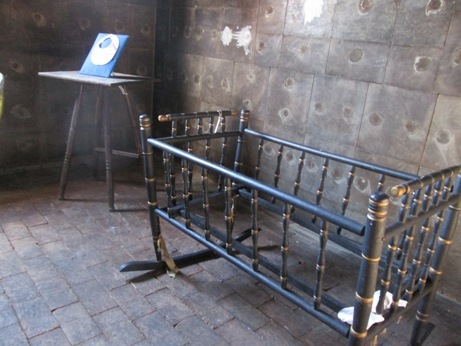 The image above shows the same textile in the pre-burn shelf view (above left) with the shrunken dark remnants of its tyvek cover after the fire. Conversely, the cotton twill tape ties are sooty but still intact. Not all plastics in our “museum” setting responded in the same way. Placement and perhaps thickness of the materials affected the risk to the nearby artifacts. Remember that hot air rises, so the intensity of fire damage tends to be opposite from the intensity of flood damage. Tyvek tags on objects nearer the floor emerged from the burn building intact. In contrast, a tyvek tag on a hanging garment shrunk and darkened, though the tiny number is still surprisingly legible. Note melted PP boxes on upper left and intact PP box on shelf below. In previous controlled burns we have tested PP storage boxes with favorable results. 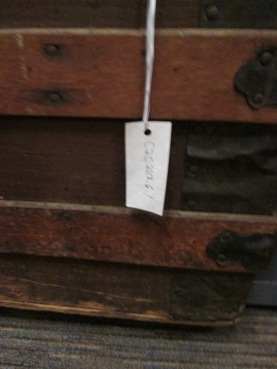 Those same storage boxes made it through our recent BuncombeCounty burn well too. Two smaller PP boxes, made from thinner plastic, melted, though still not enough to harm the objects inside. Was it the placement or the varying thickness of the plastic boxes that caused the different outcomes? Our controlled burns have taught us that plastic enclosures kept closer to the floor pose less melting risk than those at higher levels. Significantly, the closer to the floor, the greater the risk for flood and pest damage to artifacts. Also, proximity to floors and walls can increase RH fluctuations, and research has shown that plastic boxes help mitigate that collections risk. Might plastic enclosures be the best option for storage at lower levels in general? Most museum collection policies delineate steps for the placement of deaccessioned artifacts. Attempt to transfer to a teaching or prop collection within the institution. Attempt to find another collecting institution for transfer. Sell at public auction and use resulting funds for collection purposes (acquisition or supplies) only. Destroy if in total disrepair or posing a health risk. Another common guideline insists that deaccessioned objects should not be returned to the donor or a descendant for two reasons: first, the donor may have taken a tax deduction for the piece and its return would render the deduction fraudulent; second, there may be multiple descendants with competing ownership claims which the museum cannot and should not arbitrate. In addition to the above 4 typical deaccession destinations enumerated above, C2C has become another option in between #s 3 and 4 (perhaps a 3 ½?). 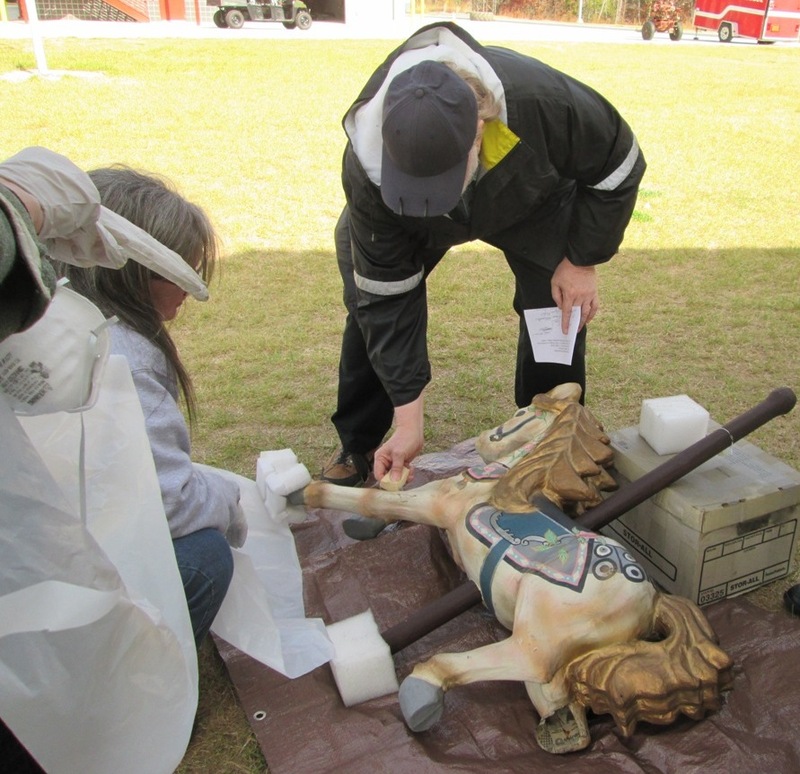 In cases where objects have no re-sale value but still have some level of structural integrity and visual interest, three North Carolina museums have opted to donate their deaccessioned pieces to C2C for our team to destroy in the mock museums we set up before our fire recovery workshops. 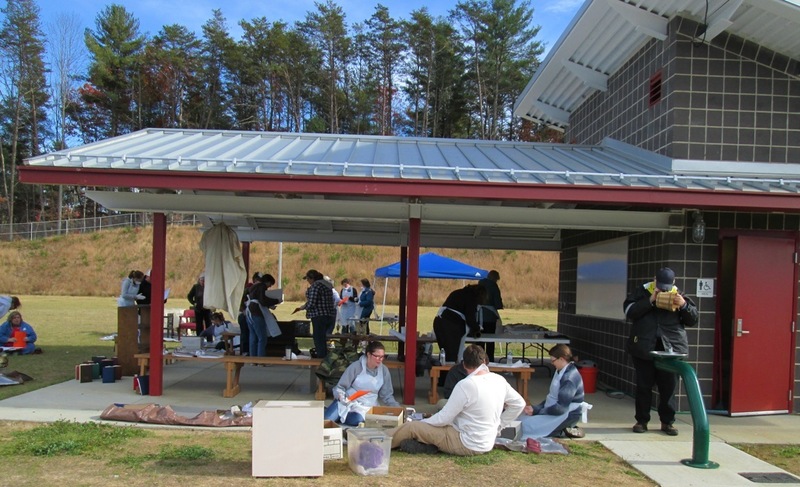 These views include several deaccessioned pieces staged for the controlled burn at the Buncombe County Public Safety Training Center. Our fire recovery workshop participants got to practice triage and recovery with these materials yesterday. Sometimes items in these scenarios survive the fire and do 2 or more tours of C2C-controlled-burn duty, but more often they are destroyed during the burn or disposed immediately after the workshop.